We now have an ALL Channels section in Favourites which contains all of the channels together (except the Non working HD channels and the test section)with no gaps, to get to this Press FAV on your Satellite Remote then scroll up or down to the last Favourite Section (labelled Fav Group 32 or ALL CHANNELS). AT THE CURRENT TIME NO-ONE KNOWS HOW TO GET THESE CHANNELS BACK, SO NO-ONE KNOWS HOW LONG THIS WILL TAKE TO FIX OR IF IT WILL EVER BE FIXED, BUT ITS VERY LIKELY THE MORE CHANNELS WILL STOP WORKING SOON. The only working version of Sly Sports News HQ has now been removed by Sly, its not possible to watch this channel on Satellite without an Official Subscription and on an Official box. Any update on this boys? More channels gone off today apparently, until I get a chance to update the channel list please try alternatives in Irish Section and alternatives after channel numbers 1260.
hi im struggling to upgrade the channel list. ive done it many times before but this time my skybox f5, when i press the ifo button after upgrade it keeps saying file not found. any ideas? Thanks for updating the channel list as often as do for us. Have I done some thing wrong? The first few channels went off at the end of March and to date no-one has managed to fix them so I think it's unlikely to be fixed anytime soon. 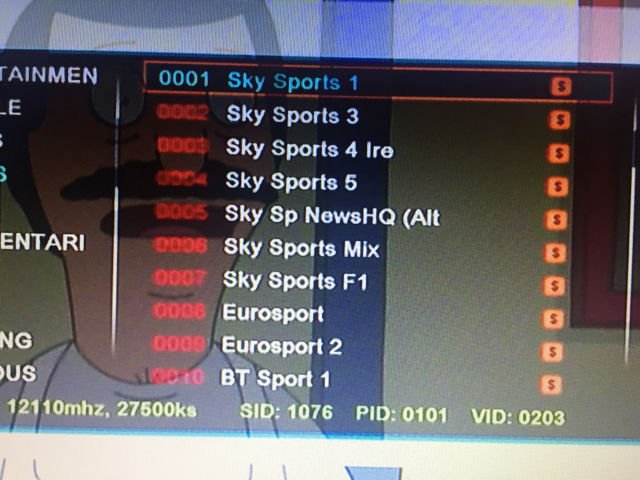 More channels went this morning nothing to do with the list, unfortunately it's Slys encryption change, I think the few remaining channels will be gone by the end of May.